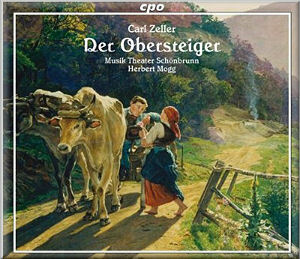 Carl Zeller’s biggest success, and only operetta still regularly performed, was Der Vogelhändler of 1891. It was indeed such a success that he included many of its most successful characteristic features in Der Obersteiger. The result was an operetta which was fairly successful in German-speaking countries for a time but is now rarely heard apart from the often recorded song Sei nicht bös. That has generally be appropriated by sopranos but was actually for tenor in the original score where it is heard here as part of the Act 2 Finale. It is certainly the most memorable of the many waltzes, but most of the others are enjoyable enough, and there is also a good stock of marches and march-like songs. Unfortunately the operetta has one of the least interesting and most inconsequential and confusing plots even in a genre where too many works have similar shortcomings. Perhaps it would be clearer on the stage, and certainly the booklet with this set makes a poor case for it by including no synopsis but instead incorporating brief and poorly translated paragraphs between the text of the music numbers (the dialogue is omitted). If I say that the First Act is set in a mining town, that a director of the mining company visits it to find out why the mine is unprofitable, that the miners are in fact already receiving help from a visiting Prince who, presumably, owns the mine, and that the Senior Overman - the title role - urges the miners to go on strike in a delightful waltz number, you will realise that whatever the title this is far from being some socialist realist drama of working class life. Add to this many confusing changes of identity and Second and Third Acts which appear to forget altogether about the mining background, and like me you will probably give up trying to follow the plot and simply enjoy the music. This is indeed the best thing to do with the work, and any lover of the byways of operetta should need no encouragement to get to know it. The performance is above all idiomatic. That is, the chorus, orchestra and acoustic are all appropriate to the scale and nature of the music, and the many soloists – most of them tenors and sopranos – may not be the world’s greatest singers but know how to put this kind of music across with conviction. The short length of the discs may put you off, although I suspect that inclusion of the dialogue would have done so even more, but if you are prepared to put that and the feeble libretto to one side there is plenty to enjoy here for the lover of the genre.